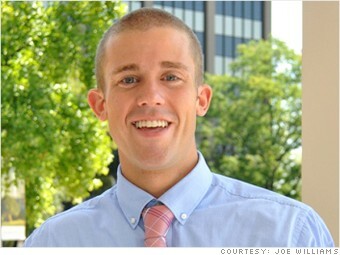 Joe Williams graduated from UNC Chapel Hill in 2011 with three internships and a good GPA under his belt. He didn't expect his first job would be an internship making $100 a week. Williams left the internship after eight months, with no advancement in sight and mounting student loan bills. A friend set him up with a contract job at an insurance firm in Virginia. "It's a great job and it pays more than the internship, but it's still a contract role," he said. "They don't have to pay me benefits and who knows? Tomorrow I could walk in and they could say they don't need me anymore and then I'm back in the same boat as before." So Williams, who still applies to regular full-time positions, is pinching pennies. "I have all these bills -- student loans, rent -- and the company can only keep me on so long as a contractor. I keep wondering when that day's going to come," he said. Since graduation, he has applied for nearly 100 jobs. "I never imagined I would be in this situation. My little brother is now going to college next year, and I don't see how it is going to get any better for him."